We also heard from a couple of people regularly or temporarily based in Central or Eastern Europe, both of whom noted how relatively little interest there was in looking back to Tiananmen and connecting China's 1989 to the upheavals that took place in that same year in the region. Grabriella Ivacs, a Budapest-based archivist at Central European University's extraordinary Open Society Archive (it has holdings on human rights, the history of Communism in Europe in particular, and other topics that are too special to try to summarize, so we'll just encourage readers to make the jump and explore their website, where they'll also find information on the innovative exhibitions OSA has mounted, some of which have dealt at least in part with China) wrote to say that "Hungarian papers and online news portals were not particularly interested in Beijing events" last week. She stressed that "Hungary is going through a serious political crisis, and [the press in] early June was focused on [the] EU election campaign." She notes that there were occasional articles on the anniversary, including one in a "left wing daily," Nepszabadsag, that placed the Massacre "in the context of 1989...the symbolic year of Transition in Eastern and Central Europe," but, "(i)nterestingly," claimed that the "1989 changes in Europe had no direct connection" to the contemporaneous "Beijing events." A. Tom Grunfeld, an American scholar spending the year in Romania (and a two-time past contributor to this site before), confirmed this sense of relative lack of interest: "Apart from CNN and a single article in every Romanian and Hungarian paper on the appropriate day (edits from the wire services as best as I can make out) there is no interest here." Yesterday I got my copy of The New Zealand Listener (the 13-19 July issue) in the mail and, to my surprise, "Has China learnt from the Tiananmen Massacre?" 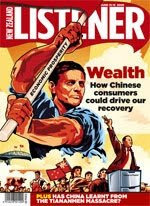 was included as part of a much longer feature story on "Wealth: How Chinese consumers could drive our recovery? " While NZ seemed uninterested to remember June 4th when most other countries' media were covering the anniversary (i.e., just before or on that very day), one of NZ most popular national magazines chose to have a reflection on those events 10 days later, when almost every other national media had moved to different topics. But maybe, rather than reading this choice as a belated answer, one can interpret it as an attempt to look at the event outside the specific temporality of the 20 year anniversary and frame it instead in the on-going economic and political engagement of NZ with China. Tiananmen becomes a provocative footnote to the economic partnership that is both needed and feared by many in NZ. The Tiananmen anniversary was discussed from two main critical angles: firstly, the issue of forced memory loss imposed by the Chinese government and how, despite the government's efforts, many are still remembering; secondly, much more interestingly (I think), June 4th was remembered with a piece on Zhao Ziyang's Secret Journal (an edited extract from the book's preface (by one of the three co-editors, Adi Ignatius). But, possibly even more interestingly, the magazine's cover itself was particularly surprising as the image (attached) clearly evokes the visual rhetoric of the Cultural Revolution posters; one wonders how familiar this visual metaphor is to the Kiwi readership. I personally find the cross-cultural mix (or mess?) that the image conveys is really intriguing and open to quite contradictory readings. See and judge for yourself. It's a pity you missed the symbolic coincidence that on the very same day tanks rolled into Tian'anmen, the first half-free elections took place in Poland on June 4th, initiating chain reaction which led to the "autumn of nations" in Soviet dominated Europe. Here in Poland the media celebrated the Polish anniversary mentioning the Beijing events just as a tiny side note. How very sad. The parallel is very telling nevertheless. I remember there was a great demonstration outside of the Chinese embassy in Warsaw those days. Even though people were celebrating their new gained freedom, still they cared for the plight of the Chinese. It seems that after 20 years of this freedom they care no longer.